Happy Wednesday! 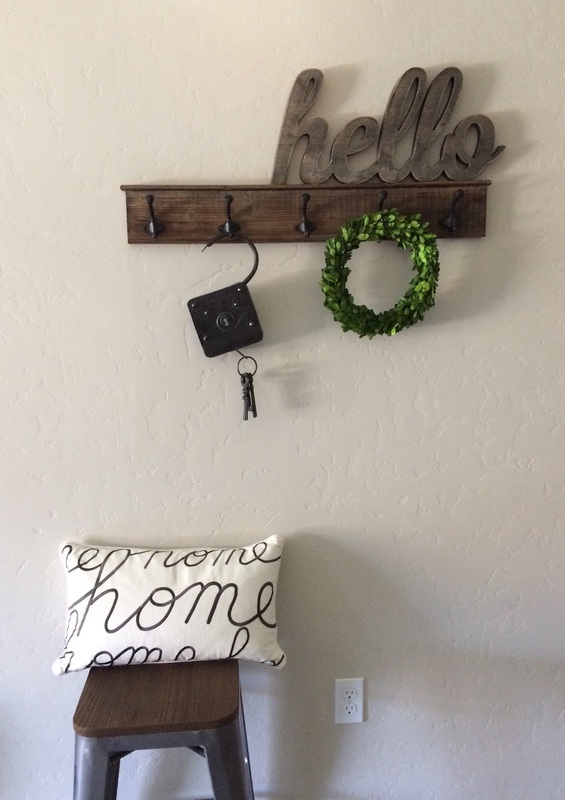 This week I continued to work on our entryway. Its been a slow process, but I think I’m getting closer and closer to being done. I’m still waiting on some personalized art from one of my favorite Etsy shops, that I cannot wait to hang up and share! 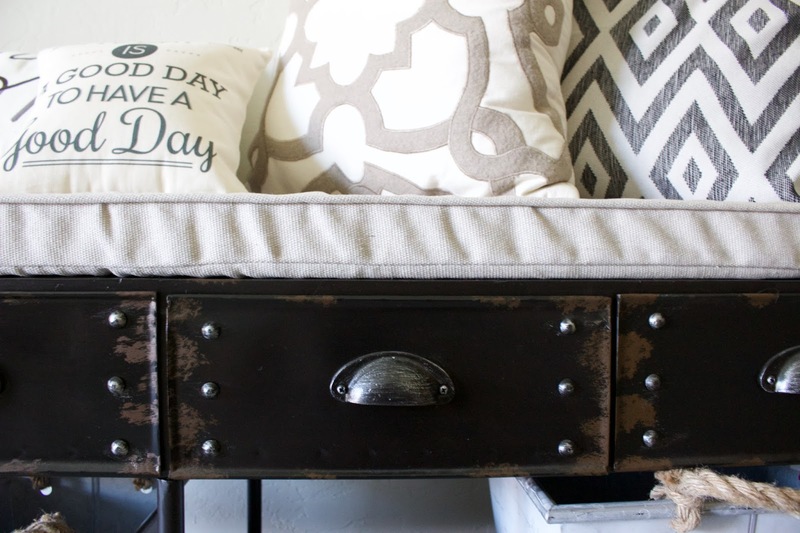 So far, I’ve DIYed a new console table, painted the front door, installed a new light fixture, and added this new bench. After seeing an industrial bench on an Instagram feed, I knew I had to have one of my own. Lucky me, my mom keeps all of her favorite catalogs and magazines. So, one night after one of our neighborhood walks I was looking at Through the Country Door and spotted this amazing bench. I came home, measured my space and got online to order it! Its been almost a year since we have lived in our home, and I’m beginning to notice all the “wasted space” of the floor plan. Our entry way is so big, it is practically another room. It has been somewhat of a challenge for me to decorate. For the past few months, I had two benches in the space. I hated it. I’m so glad I ditched two small benches, for one big one and a stool. Our floor plan is so open, its hard to define every space so some furniture items have to provide double duty. 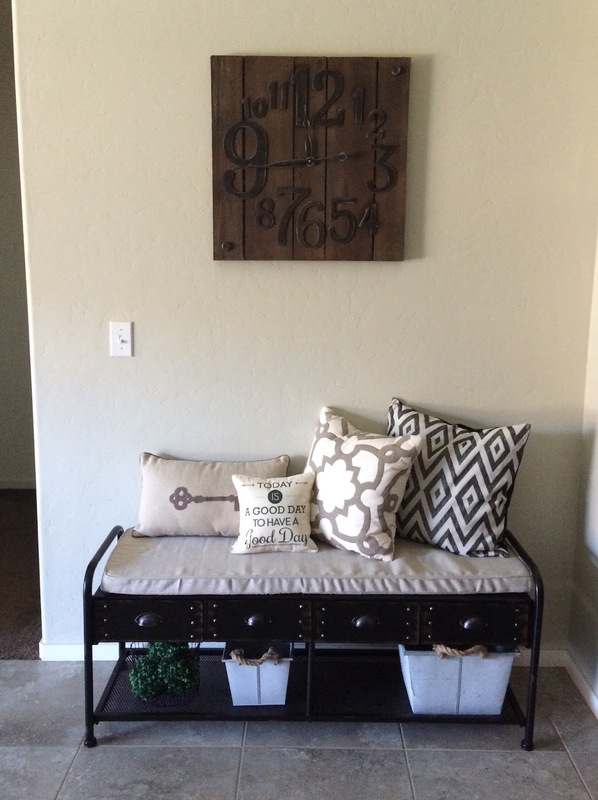 Pillows on the bench add some welcoming comfort, right before leading into our living room. It also provides extra seating during family BBQs and get togethers. 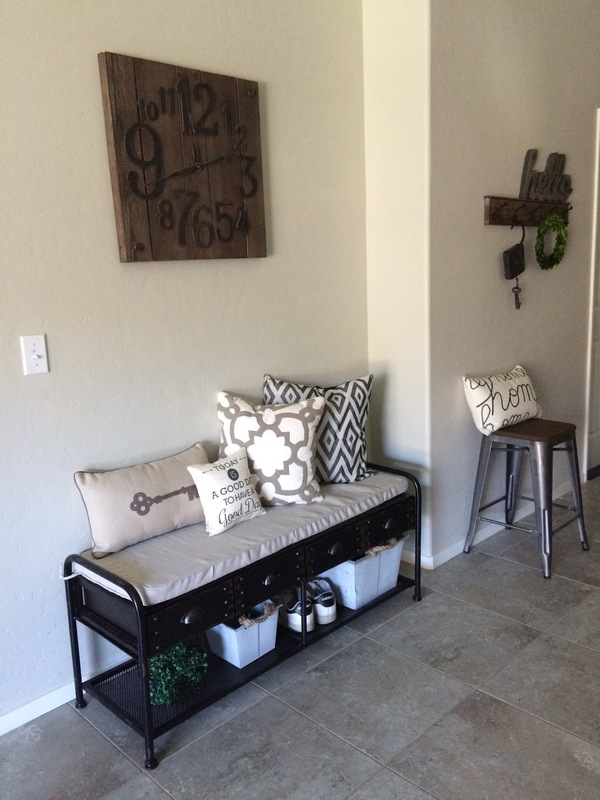 The bench was easy to put together and has the industrial look I was going for. Our flip flops and sandals fit perfectly in the drawers. The metal bins I bought a few months ago at Marshalls – they hold our tennis shoes and the dog leash. 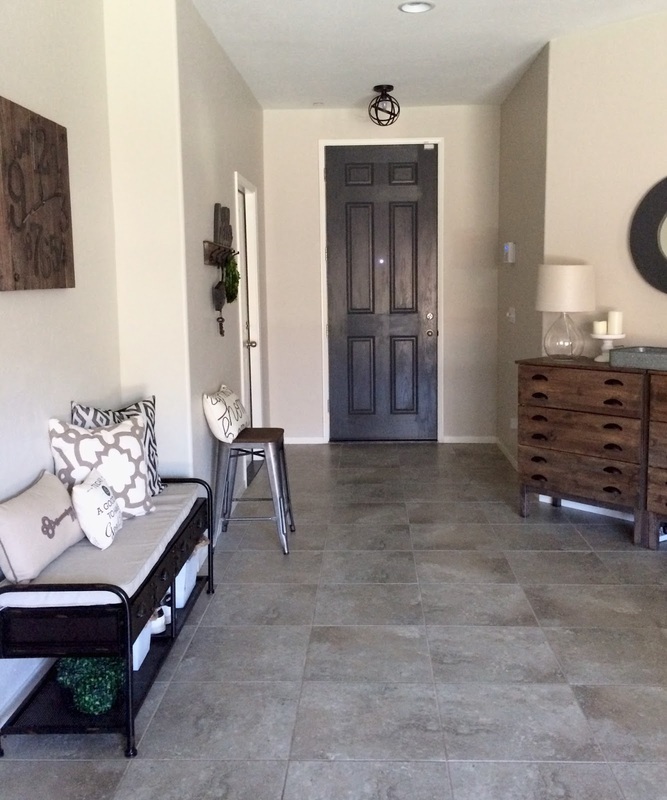 As I mentioned our entry way is such a large space, I wanted to create two zones. One for sitting down and putting on your shoes, and this smaller zone for hanging jackets and hats. Joe wears a hat to work, so his hat usually hangs here. The industrial stool from Target is the perfect place for my purse. I picked up the pillow from Marshall’s last week. I have a pillow obsession and couldn’t leave without it. The hooks and lock & key decor is also from Marshall’s. 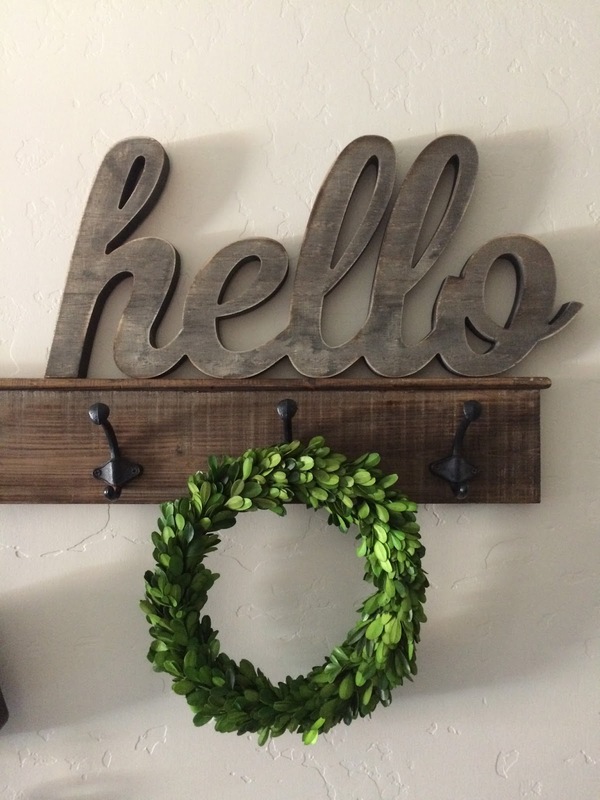 My favorite “hello” sign is from Hobby Lobby. I am so glad this entry space is almost done. I’m feeling like our great room is finally coming all together, which means I can move on to our master bedroom and bathroom. I have big plans and cannot wait to get started! This space turned out great I love all the little details and thought you put in to decorating the area! The addition of the industrial bench was spot on too!! love this space Allision! and you know how i feel about the awesome ikea hack! its perfect here! 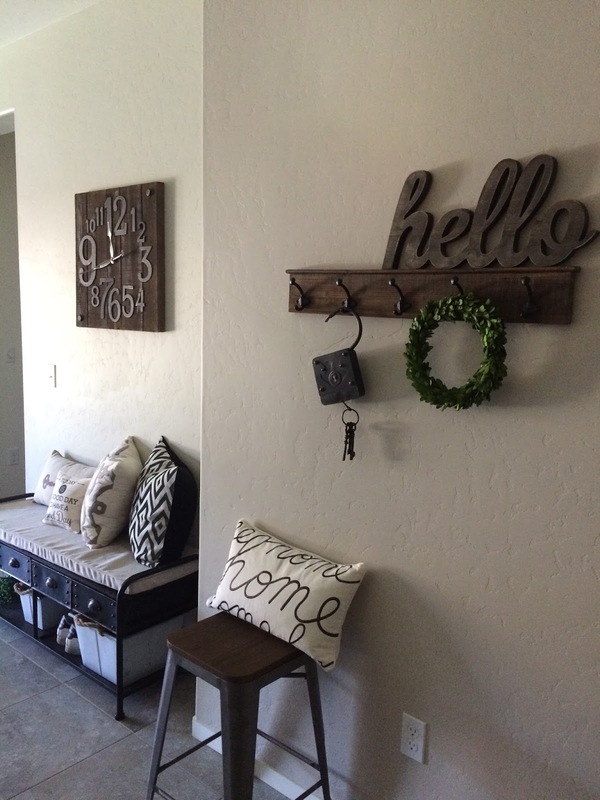 The entryway looks awesome! The accessories are very cool and give a great industrial look! Do you happen to remember what floor tile name is? I have been looking for a tile with that blend of colors and have been having a very hard time finding what I have pictured in my head. I don’t, sorry. They came from our builder.